The Tampa Bay Rays offense came to life Monday night after averaging 2.75 runs per game against Houston, putting up seven runs against Chad Bettis and the Colorado Rockies. The Rays have now won four consecutive games after dropping the first game of the season. Ryan Stanek opened ballgame and threw a scoreless frame for Tampa Bay, working around a soft single to Nolan Arenado while recording three punch-outs. It would be safe to say that Stanek’s inning of work set the tone for the rest of the ballgame. Ryan Yarbrough followed Stanek and allowed just one run across 4-1/3 innings of his 2019 debut. The southpaw gave up just three hits and a hit batsman while striking out three. The Rockies scratched across their lone run against Yarbrough in the sixth inning. With one out in the frame, Yarbrough hit Charlie Blackmon with a pitch before David Dahl hit an opposite-field single left. Rays manager Kevin Cash called upon Wilmer Font to face Arenado, thus setting up a right on right matchup. The third baseman promptly doubled down the third base line, driving in a run. Font got Trevor Story to pop out in foul territory before Jalen Beeks was beckoned from the bullpen to face Ryan McMahon. Beeks, who updated his delivery — allowing him to hide the ball well and offer more deception — collected an inning-ending strikeout, stranding a pair of runners in scoring position. Beeks also worked around a walk in a scoreless seventh, while Jose Alvarado struck out two the eighth (18 pitches, 11 strikes, 61% strike rate), and Diego Castillo struck out the side in a 1-2-3 ninth (14 pitches, 10 strikes, 71% strike rate). The Rays bullpen has allowed just one run in the first 21 innings, while the pitching staff has allowed 10 runs total in the first five games. That is to say, the pitching staff looks incredibly deep. On the offensive side of things, Tampa Bay got on the board in the fourth inning. 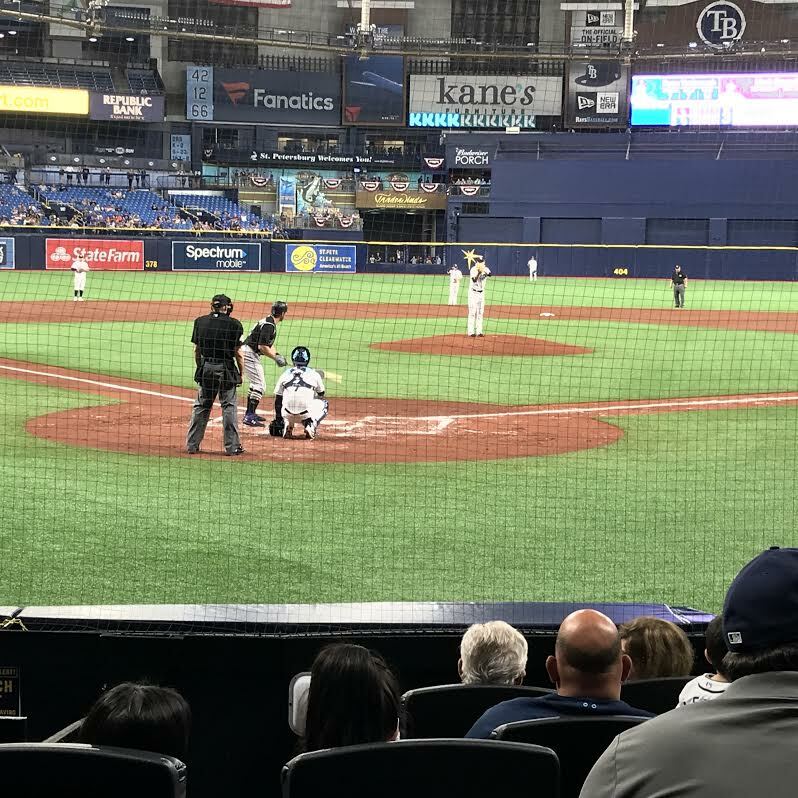 Chad Bettis held the Rays hitless across the first three frames, yet that all changed when Ji-Man Choi sparked a three-run rally with a first-pitch single to left against the shift. Two pitches later, Brandon Lowe snapped an 0-14 skid by hitting a two-run blast to left. Yandy Diaz followed by working a free pass, then went from first to third on Kevin Kiermaier’s ground rule double that bounced over the short wall in left. Daniel Robertson capped the scoring with an RBI groundout, putting the Rays up by three. Tampa Bay took control of the game in the sixth inning when they knocked Bettis out of the game. Up by a pair, Lowe and Diaz each singled to center. Kiermaier stepped into the box with a chance to break the contest wide open, and he did not disappoint — drilling a three-run homer to right to put the Rays up by five. Kiermaier, who drove in four of the seven runs, hit a bases-loaded sacrifice fly to center field an inning later, tacking on the final run. The Rays and Rockies play game two on Tuesday night in a matchup of aces. Blake Snell (0-1, 7.50) will square off opposite fellow left-hander Kyle Freeland (1-0, 1.29 ERA). Blake Snell looks to bounce back from a rough outing on Opening Day. Snell took the mound in the first inning and mowed over the first three hitters in order, all on 13 pitches (10 strikes) — coaxing a pair of pop-ups and getting Alex Bregman to chase a filthy 80 mph off-speed to cap the frame. After Snell worked around a Gurriel single for a scoreless second inning, he was roughed up as Houston took the lead in the third. Snell walked Robinson Chirinos on a close full-count pitch before number nine hitter, Jake Marisnick, worked six-pitch free pass of his own. On the very next pitch, George Springer blasted a curveball over the center field wall for a two-run lead. In the fourth inning, Michael Brantley paid Snell back for a second inning swinging strikeout, depositing a first-pitch fastball to right field, while Jose Altuve homered to left in the fifth. Last season, Snell allowed three homers only once, on May 13 against the Orioles, and two times when he allowed as many as five runs. Snell is known for his repertoire of four pitches, yet on Thursday he leaned heavily on his fastball (35) and curveball (34) — 76% of the total number of pitches he threw. To his credit, the reigning AL Cy Young Award winner was able to finish six innings on 91 pitches (55 strikes, 60% strike rate), although he allowed six hits and two walks while striking out just three. Snell did not strike a batter out over the final four innings. You can read about the series in our preview (linked below)..
Charlie Morton hurled five solid innings on Friday night, while the Tampa Bay Rays scratched across three two-out runs, en route to a 4-2 win against the Houston Astros on Friday. Morton took the mound against his former team who he most recently played with for the past two seasons. The right-hander was amped up, hitting 97.9 mph on his fastball when he fanned George Springer for his first punch out of the season, setting the tone for the night. From there, Morton threw two scoreless frames before Houston broke out on top in an erratic third by the hurler. Tony Kemp was hit by a pitch to lead off the inning and then promptly swiped second. After George Springer struck out, Jose Altuve walked on a close full-count offering. Morton was able to strike out Alex Bregman, yet Michael Brantley lined a double down the right-field line, plating the only runs the Astros would score on the night. His swing and miss breaking ball was exactly what we talked about before the game. He’s tough when he can get it in the strike zone, he got a little erratic with it when we put some pressure on him but he was able to come back and make some really good pitches. I’ve seen that quite a few times. However, the lead was short-lived, as Tampa Bay answered with three runs in the bottom of the third to take the lead against Gerrit Cole, who had struck out five of the first six batters. Kevin Kiermaier got things started with a base hit into shallow left-field. After Willy Adames lined out to right, Mike Zunino reached on Aledmys Diaz’s throwing error — his second error in as many days. Austin Meadows moved Kiermaier to third on a deep fly-ball to center before Tommy Pham lined an RBI single to right, putting the Rays on the board and sending Zunino to third. Finally, Pham swiped second, ahead of Ji-Man Choi’s go-ahead single to center, scoring both base runners. The rally put Morton on the right side of the ledger. The right-hander went on to retire six of the last seven batters he faced — a series that began by fanning Yuli Gurriel, marking his 1,000th career strikeout. Morton relied heavily on his curveball — 34 thrown, 20 strikes 59% strike rate, 6 whiffs, 30% SwStr — with which he collected seven of his eight strikeouts. The veteran allowed just three hits. He looked good, about right where we expected him to be, very sharp. He looked good, about right where we expected him to be, very sharp. He’s a good pitcher. He’s worth every dollar of that, $30-million contract. Diego Castillo followed with two scoreless innings, leaning heavily on his upper 90’s fastball (5 thrown, 3 strikes) to set up his slider (14 thrown, 13 strikes, 4 whiffs). Castillo allowed two singles in his first inning of work, although he coaxed a 4-6-3 double play out of Josh Reddick, which was punctuated by a pretty glove flip by Daniel Robertson. Then in the bottom of the inning, Tampa Bay extended its lead when Yandy Diaz hit a bullet — albeit a wall scraper — to centerfield for his first homer as a Ray. Cole, who hadn’t given up more than four runs in any start in 2019, allowed four on Friday night. Castillo followed with a perfect seventh inning. Chaz Roe took the mound in the eighth, and after walking Springer, he got the next two batters to ground out. Roe gave way to southpaw Adam Kolarek, who was brought in to face the left-handed hitting Michael Brantley. Kolarek needed just one pitch to get Brantley to ground out to end the frame. Finally, Jose Alvarado took the mound as the de facto closer. Alvarado was able to get the first two outs on six pitches, yet he allowed a single to pinch-hitter Tony White, then walked another pinch-hitter, Robinson Chirinos. But with two on and two out, southpaw hitter Tony Kemp promptly fell behind Alvarado before he swung through a filthy slider to end the game. Back for 2019… it's 🌮 time! Tyler Glasnow (1-5, 4.20 ERA) will get the start in the third game of the season, pitching opposite of Collin McHugh (6-2, 1.99 ERA) in a battle of righties. 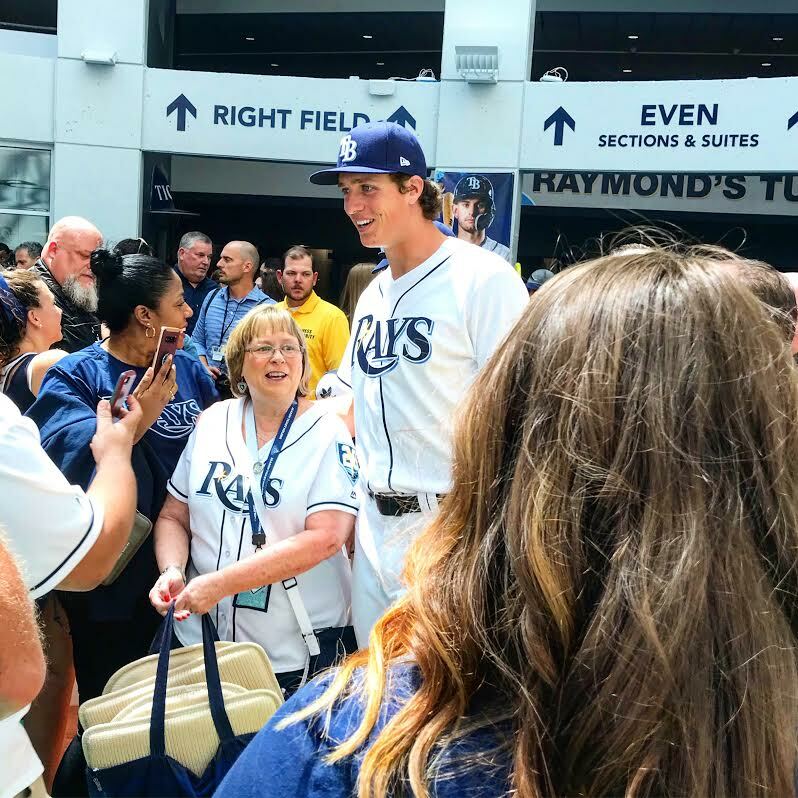 Tyler Glasnow finished 2018 with the Rays, posting a 1-5 record and a 4.20 ERA/4.44 FIP across 11 starts, although he displayed his potential on the mound. He is projected to improve on his numbers in 2019, and the matchup against Houston will be the first chance for Glasnow to test his new delivery during the regular season. In 2018 he relied primarily on his whiffy 97 mph four-seam fastball that also generates a fair number of ground balls, and an 84 mph 12-6 curveball with sharp downward bite. He rarely throws his hard 92 mph changeup and an 86 mph slider. You can read about the series in our preview, while the starting lineup is below. 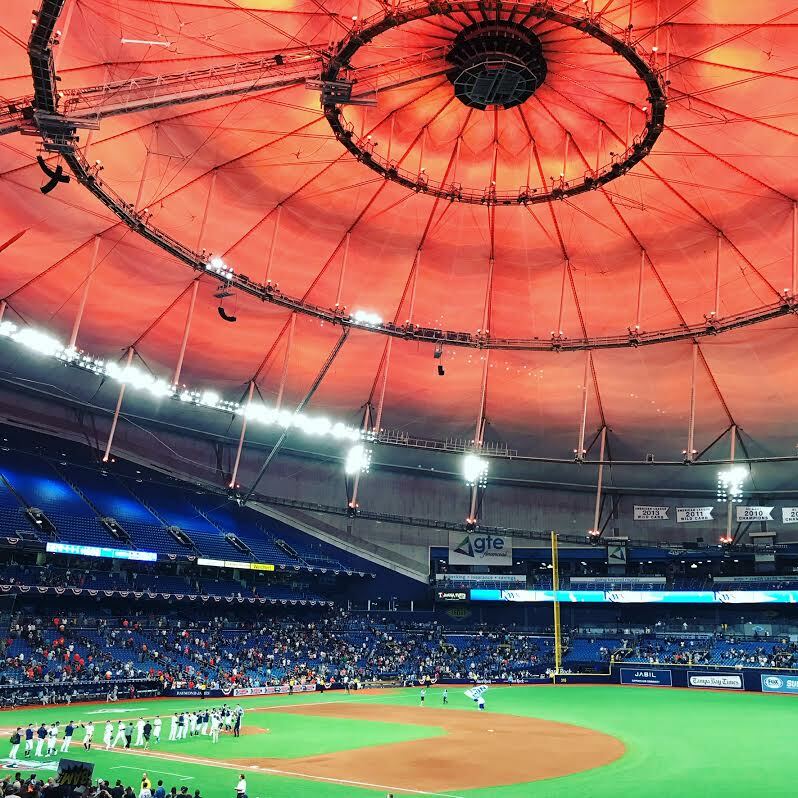 Things looked promising in the early stages of the season opener for the Tampa Bay on Thursday, yet the Houston Astros went on to hand Blake Snell the Rays a 5-1 Opening Day defeat in front of a sellout crowd. Snell took the mound in the first inning and mowed over the first three hitters in order, all on 13 pitches (10 strikes) — coaxing a pair of pop-ups and getting Alex Bregman to chase a filthy 80 mph off-speed to cap the frame. Meanwhile, Tampa Bay took an early lead in the bottom half of the inning. Austin Meadows led off the home half with an opposite-field home run, his first ever leadoff homer. It was the first Opening Day leadoff homer for the Rays since Gerald Williams in 2000 off Brad Radke. First AB of the season? I kind of blanked out, I don’t remember much. But being able to do that first at-bat of Opening Day it’s definitely special. .. It’s cool. I just put a swing on a good pitch that he made. I was able to get the barrel out and get a good swing on it. Tommy Pham followed with a single to center, which extended his on-base hit streak to 33 games (dating back to last season) — the fourth-longest streak in franchise history. Yet Pham, who reached base twice, got caught in a pickle during Ji-Man Choi’s at-bat for the first out of the season. Choi and Brandon Lowe then grounded out and struck out (respectively), while Tampa Bay settled for just one run. The Rays had another chance to extend that lead in the second inning when Yandy Diaz walked and Joey Wendle was hit by a pitch; the first of two on the day. However, Willy Adames and Mike Zunino both struck out, sandwiched around Kevin Kiermaier’s ground out fielder’s choice. That began a string of at-bats where Verlander retired 14 in a row, allowing Houston to take control of the contest. In the fourth inning, Michael Brantley paid Snell back for a second inning swinging strikeout. Brantley deposited a first-pitch fastball to right field, while Jose Altuve homered to left in the fifth. I was happy with a lot of things I did. The only thing I was upset with was sequencing. I didn’t mix pitches like I should’ve been doing. I did it later, but to learn that, it took me giving up home runs. I fell in love with the curveball and kept throwing it. It’s a good team, and that’s what they’re going to do. Frustrating, but a lot to learn. A lot to learn, and I’m happy about that. To his credit, the reigning AL Cy Young Award winner was able to finish six innings on 91 pitches (55 strikes, 60% strike rate), although he allowed six hits and two walks, while striking out just three. Snell did not strike a batter out over the final four innings. Jalen Beeks followed Snell and threw three scoreless innings, while fanning five (four swinging) and scattering four hits on 54 pitches (38 strikes, 70% strike rate). Beeks topped out at 94.7 mph with his fastball and leaned on a new delivery where he pauses ever so slightly and hides the ball well on his lefthand side. If results are indicative of anything, his new delivery is effective and deadly. Superlatives aside though, at the end of the day the Rays were held to just four hits, two by Pham. True, Justin Verlander is an outstanding hurler and was complimentary of Tampa Bay’s hitters, yet Mike Zunino, Willy Adames, Brandon Lowe, and Kevin Kiermaier looked abysmal at the plate and combined for eight strikeouts. Moving forward, there’s always tomorrow. Game number two of the season is on Friday with another terrific pitching matchup. Charlie Morton (15-3, 3.13 ERA) will face his most recent team, pitching opposite of Gerrit Cole (15-5, 2.88 ERA). Charlie Morton will make his first regular season start with the Rays since coming over from the Astros, whom he helped win a World Series in 2017. Morton, who made his first All-Star appearance in 2018 — thanks to a 3.13 ERA and 201 punch outs — inked a two-year deal during the winter. Last season he relied primarily on a whiffy 80 mph knuckle curveball, a 96 mph two-seam worm burning sinker, and a swing-and-miss 97 mph four-seam fastball with obvious tail, while also mixing in an 88 mph splitter with arm side fade, and a whiffy 89 mph cutter. For the first time since 2013, the Tampa Bay Rays finished the regular season with a 90-72 record. Tampa Bay pulled in front of the Toronto Blue Jays for good in a three-run fifth inning Sunday afternoon, then won 9-4. Toronto scored the first run of the game in the third against Ryan Yarbrough. Kevin Pillar came up with a two-out single, then moved into second on a passed ball. Randall Grichuk followed with a double to left, putting Toronto up by a run. Yet Tampa Bay answered with a pair of runs in the bottom of the inning against Sam Gaviglio. Jake Bauers led off the inning with a single to right, stole his way into second, and went to third on a wild pitch. With two outs and a runner at third, Tommy Pham walked and stole the teams third base of the game. But the responding throw by Reese McGwire ended up in centerfield, which allowed Bauers to cross the plate and Pham to move into third. Joey Wendle capped the rally with a base hit through the left side, putting Tampa Bay in front for the first time. But, Toronto tied the game in the fifth inning against Yarbrough. With two outs, the southpaw allowed a bloop single to center to Richard Urena before Pillar doubled over the head of Austin Meadows in right, plating a run. After a six-pitch walk to Randal Grichuk, Yarbrough coaxed a fly ball out in foul territory to prevent any further damage, keeping the game even. Tied at two entering the home sixth, Bauers collected his second hit of the day — bunting against the shift for a hit to start a go-ahead rally. Nick Ciuffo followed with a sacrifice bunt, moving Bauers up to second. One pitch later Smith singled to right-center, scoring Bauers and putting the Rays ahead by a run. Not content with just 39 steals on the season, Smith swiped second — his second of the game and 40th of the season. Smith’s 40 steals are the most for a Ray since Carl Crawford’s 47 and B.J. Upton’s 42 in 2010. Pham — who had reached base in 33 consecutive games with his third-inning walk — tripled to left-center, stretching the lead to two runs before Wendle hit a sac fly to center, capping the three-run rally. Still, the Blue Jays answered in the seventh inning against reliever Hunter Wood, the third Rays pitcher of the day. Wood walked Teoscar Hernandez, who went to third on a single to right by Rowdy Tellez. Hernandez ultimately came home on an RBI groundout by Aledmys Diaz to make it a two-run game. However, the Rays tacked on three runs in the seventh on Brandon Lowe’s sac fly and Bauers’ two-run double, which put the Rays up by five. Both teams added a run on double-play groundouts the following inning. All told, Tampa Bay collected 10 hits with three each from Bauers and Pham. Meanwhile, Austin Pruitt fired off 3-1/3 innings of one-run ball. Wendle, who became the first Tampa Bay rookie hitter to hit .300 in a given season (and the first .300 hitter for Tampa Bay since Casey Kotchman in 2011), was lifted in the eighth inning to a standing ovation. He later came out for a curtain call. At the end of the day, Tampa Bay’s 90 wins feels important. True, there really is not much of a difference between 90 wins and 89 wins, especially without the benefit of a postseason berth. Yet after a 1-8 and 4-13 start to the season, 90 wins feels like a revelation. Pair that with the fact that the Rays were in the running for a Wildcard spot with six games left to play, in the last week of the season. Fans and players alike caught a whiff of something they hadn’t in five long years. That whiff makes the team a much more formidable presence going into the 2019 season. We should be very proud of the way we played this year. The things we accomplished. The groundwork we laid. But we’re not satisfied. … We need to go into this offseason, enjoy ourselves, take a month, then get back after it. I’m excited to be a part of this whole organization. This is a great group of coaches. We have a great manager and a great group of 40 guys. Any time you’re generally excited to go to work and you’re excited about being able to hang out with your boys, your buddies, just go have fun and have baseball be enjoyable with guys you actually like, it’s a huge thing. We’re looking forward to next year. The Tampa Bay Rays got off to a good start on Friday yet couldn’t finish off the Toronto Blue Jays. The Rays squandered three leads in the 7-6 loss, leaving them with no wiggle room for mulligans in the quest for 90 wins with just two games left to play. After a terrific month-long stretch of play, Tampa Bay has dropped four of five. The Rays took a three-run lead in the first inning against southpaw Thomas Pannone, who previously held them to just two runs. Mallex Smith led off the game with a triple to left-centerfield, while Tommy Pham walked — extending his on-base streak to 30 games. Joey Wendle drove in the Rays first run when he doubled down the left field line, plating Smith from third and moving Pham up 180 feet. CJ Cron was next, sending a sacrifice fly to left and pushing the lead to 2-0. Finally, Willy Adames capped the inning with an RBI single to right-center. Yet Toronto immediately answered against Tyler Glasnow when Teoscar Hernandez homered to right-center on the first pitch of the second inning, drawing the Blue Jays within two. Still, the Rays stretched the lead back to three runs in the fifth inning after Smith reached on an infield hit. Even though it appeared that he was picked off first, the throw to second went off of Richard Urena’s glove which allowed Smith to scamper into third on what was scored a stolen base and an error. Pham followed with a sac fly to right for a 4-1 advantage. However, the Blue Jays tied the game in the sixth. Rowdy Tellez started the rally with a homer to right, then with one out Reese McGwire singled and Dwight Smith Jr. walked, chasing Glasnow. Enter Adam Kolerek. Even though McGwire was thrown out trying to advance to third for the second out, Urena singled to left — putting two on for second baseman Jon Berti, who punched a ground ball into center field for a hit. Both Smith and Urena scored as the throw came in to second. Tampa Bay was able to take the lead back in the bottom of the inning. Willy Adames led off with a walk, moved up to third on a one-out single to right by Austin Meadows, and came home on a safety squeeze bunt single by catcher Adam Moore off reliever Jake Petricka. Be that as it may, the Rays scored just the one run in the frame, which allowed Toronto to take the lead back for good in the top of the seventh. Chaz Roe started the inning by allowing a leadoff hustle double to left-center to Kevin Pillar. Yangervis Solarte grounded to third, as Roe was pulled in favor of Jose Alvarado. Tellez grounded to second but Brandon Lowe committed his first big league error, putting runners on the corners with one out. Hernandez walked to load the bases before pinch-hitter Randall Grichuk cleared the bases with a three-run triple to right. Tampa Bay was able to get within a run on a no-doubter to center by Adam Moore, his first MLB homer in six seasons. Smith, who was a homer* shy of the cycle, then doubled to left-center off Jose Fernandez, leading John Gibbons to call upon Ryan Tepera, the sixth pitcher of the night for Toronto. Tepera struck out Pham and Wendle and got CJ Cron to fly to right, ending the threat. Ken Giles closed out the game with a scoreless ninth. *Smith crushed a ball to the deepest part of the park in the sixth, just shy of the wall in center. The second game of the series is on Saturday as Blake Snell (21-5, 1.90 ERA) makes his final start of 2018 opposite of fellow southpaw Ryan Borucki (4-5, 3.76 ERA). Snell blanked Toronto across 6-2/3 innings on Sunday, allowing three hits and two walks. He struck out 11. The southpaw was outstanding once again, winning his ninth consecutive start. Snell relinquished just three singles and during his nine-start winning streak has given up only six earned runs in 46 innings. He has a sterling 1.90 ERA and a 0.96 WHIP this season. For Snell, who became the Rays’ third starting pitcher to win the team MVP award on Friday (joining Tanyon Sturtze in 2001 and James Shields in 2011), consider this his final tuneup ahead of a potential Cy Young Award win.